Go to Settings menu by default when opening f.lux from system tray? 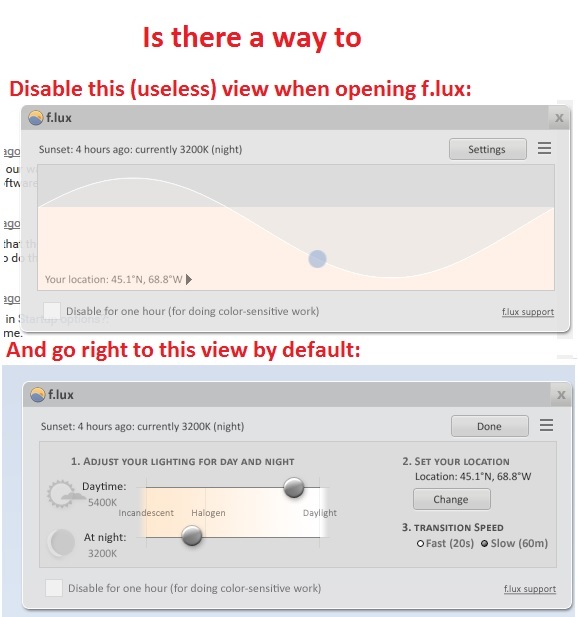 When I open f.lux from the Windows system tray, I find the time graph menu useless. When I try to drag the dot, it does this annoying preview thing that can't be aborted. I always have to click Settings. I would like the application to ALWAYS open to the Settings dialogue by default, where I can access the sliders. Is this possible? Does anyone else find this screen to be useless? Thanks. No, but I would like to see this in the next version. What you see first is just a preview, so that's all it's for. It's just to show you what your configuration will look like. It is also there to give you a graphical representation of the sun's location and when sunrise and sunset will occur and for how long. To be honest, I would definitely prefer what you want here because I sometimes miss the Settings button and I activate the Preview instead. Now yes, it stays on the Settings 'side' during the same session of f.lux if that's the last thing you looked at, but as you are saying, it's always on the Preview side on a fresh start of f.lux and that's what's annoying.